Christina said Josh chose a Stevie Wonder song and “it’s scary how much he sounds like him,” she said. Amber Nicole at only seventeen-years-old is his competitor in this Knockout round. Amber Nicole sang “Mama Knows Best” by Jessie J. Josh sang “Living For the City” by Stevie Wonder. Amber said, she is not intimidated by the talent on CeeLo’s team and went with CeeLo. Kat picked “You Oughta Know” by Alanis Morissette to sing. She said, “I feel it represents me as a performer – angst.”. She’s a wonderful vocalist, but I’m looking for the best fire extinguisher for the live shows,” said CeeLo. Monika lost in the battle round but then was stolen by CeeLo. She’s singing “Hit the Road Jack” by Ray Charles. Monika said she wanted to show the blues side of her. Adam said of Kat’s performance, “you’re a rock star. A couple of times it looks like you’re going to kill somebody. Monika is a little more calculating.” He favored Kat. Blake admired the beauty of the two women – “I don’t think we’ve ever had two sexier girls on stage. People are going to handcuff men to drag them away from Monika. Kat, people are going to have to handcuff Kat,” he said to keep her away from the concert goers. He chose Monika. Christina reacted, “Kat is crazy, crazy great. Can you feel it? Yeah I can feel it! I love both for different reasons.” CeeLo was torn, and said they represent “each end of the spectrum. Monika some of the sultriness was lost in the translation.” He based his choice from this performance alone. He chose Kat. Christina said she didn’t think that Monika had the vocal consistency that Kat had. Holly chose to sing “Creep” by Radio Head. Blake said, “This is a great song choice for Holy and the type of artist that she wants to be. But it’s very challenging vocally. Blake said she will have to work hard. Nic was stolen by Blake. Nic sang “Genie in a Bottle” by Christina Aguilera. Blake said “It’s always a risk” when singing a coaches song. “If I don’t nail the lower register, there’s a real possibility that I could be going home,” said Nic. Christina reacted, “I love that song! ‘Creep – I love that. Mr. Genie in a Bottle you brought me down memory lane.” She said it was a toss-up. Adam told Holly, “The emotion you were showing did overcome your performance,” and to Nic he told him that he missed him and thinks about him every day. He picked Nic. Blake said, “Holly you were as invested in that performance as you could be. It worked. Nic, you are confident at being who you are and owning it and displaying it to the world. You are proud of it.” He said they are apples and oranges and are on two opposite ends of the spectrum . He picked Nic. Blake picked Nic because he said Nic “addressed all the notes” that he addressed. “Hey Soul Sister” by Train Ashley said she chose this song so people can see the upbeat side of her. Tessanne said it’s time for her to go to “the next level.” She said she chose Adam for a coach so she could grow. She sang “Stronger (What Doesn’t Kill You)” by Kelly Clarkson for the message in the song. Adam said, “Ashley isn’t dissimilar.” Adam said he is going for who will “best represent to step out and try new things.” But, most important, he said, “People that are in the position to win the whole thing.” He chose the winner of the knockout as Tessanne. Briana was stolen by Blake in the battle rounds from Christina. She said she wants to show some of the rock side. She picked to sing “Don’t Speak” by No Doubt. Shelbie chose to sing “Last Name” by Carrie Underwood. She chose this song because it’s the song she wins contests with. Grey chose to sing, Kelly Clarkson’s “Already Gone.” Grey said, “That’s the kind of artist I want to be. I want to be a story-teller” is why she chose the song. James picked “Breakeven” song by The Script. He said he chose the song because he thinks about when he lost his daughter. Destinee said she picked “See You Again” by Carrie Underwood for the personal losses in her life. Olivia chose to sing “You’re No Good” by Linda Ronstadt. She said she selected this song to take country, pop and rock which “showcases who I am as an artist perfectly.” During rehearsals Christina told her she was being too “karaokeville”. Adam said he heard more issues with Olivia but it’s pretty much “dead even.” Blake said Destinee was flat, and that their problems were even. He said Olivia was “consistently sharp.” He said when given the choice, he’d pick someone who is sharp. So, his choice was Olivia. Christina told Destinee “You operate on emotions. Olivia you let nerves take over.” She said that they both did let nerves take over a little bit. She picked the winner as Olivia because she said she had a little bit more “skill and experience.” Blake didn’t attempt to steal Destinee because he said he already has a female country singer on his team. Don’t Look Him in the Eye! Adam said “these are two of my biggest regrets with their hats and long hair. I think you’re both spectacular.” He said he’d steal whomever didn’t win the knockout. Blake teased the two singers about their appearances – “It looks like someone else is filming a Western. Jonny, I never heard a voice quit like yours. Cole had more control over his voice,” he said. So, he picked Cole. Adam pushed his button to steal Cole, then Blake also pushed his button. 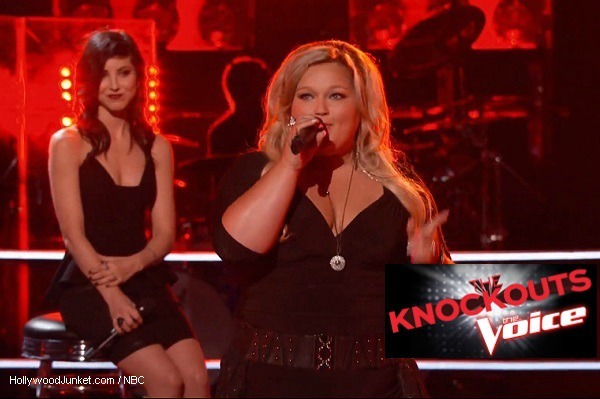 WATCH – THE VOICE Season 5 Episode 11 “The Knockouts Part 1” originally aired by NBC on Monday, October 28, 2013.